This cable fly machine includes two chrome handles that you can use to perform flys and other exercises. While shaking is an issue with some cable fly machines, the fact that part of this machine's installation includes bolting it to the floor means you won't have to worry about that issue. One of the key features of this machine is you can pick from 11 different positions for the cables. This means that in addition to moving them to the top and bottom of the machine, you can also move them to a wide range of other positions. This will make it easy to perform any exercise that you want. Another positive feature of this machine is its precision bearings. Thanks to these bearings, you will be able to pull the cables without worrying about encountering any unwanted friction. The one user review for this machine is 5 stars. What's really impressive is the reviewer gave it 5 stars despite receiving a damaged unit. The reason is he contacted Champion about the damage and they sent out a brand new machine on the same day. The Champion Cable Crossover Machine sells for $2598. While this cable fly brand is one of the most affordable that's available, that doesn't mean it's cheaply built. The machine is built from heavy gauge steel that's designed to last. And although it will fit perfectly in your home, it's actually strong enough to be used in a gym. You'll have no trouble doing multiple types of cable flys on this machine. The one Amazon review for this machine is 4 stars. 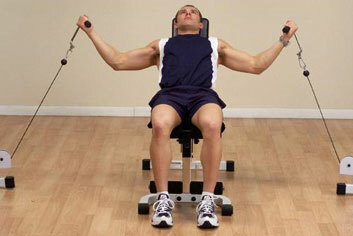 The reviewer notes that the machine works very well and allows those using it to thoroughly work out their bodies. His only word of caution is it does take some effort to properly assemble the machine. The Multisports Fitness Pro Cable Crossover Exercise System sells for $579. One of the features that makes this brand of cable fly machines so useful is you can choose the exact cable height you want to use. From downward standing flys to reverse cable flys, you'll be able to do exercises that will help you make the improvements you want to your body. This machine has two Amazon reviews. Both reviews are 5 stars. The first reviewer was quite impressed that this machine is able to support up to 450 pounds on each side. Even if you're committed to getting as strong as possible, this amount of weight means you won't have to worry about progressing past using this machine. This reviewer also mentions that pulling the cables is a very smooth experience. The second reviewer notes that her husband is very happy using this machine. Both reviews do mention that it's useful to have two people who can assemble the Crossover. The Yukon Cable Crossover sells for $1099.